HARLINGEN, Texas -- A stray bullet struck a Texas state representative in the head during a New Year’s Eve celebration early Sunday, he told CBS affiliate KGBT. State Rep. Armando “Mando” Martinez, D-Weslaco was struck by the stray bullet while welcoming the New Year with his family. “It felt like a sledgehammer hit me over the head,” said Martinez, who called KGBT from the hospital. 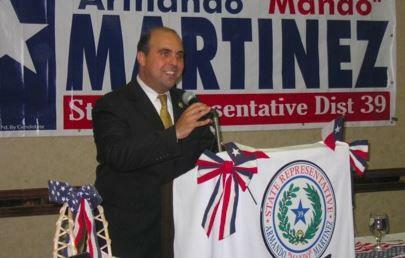 Martinez was rushed to Knapp Medical Center in Weslaco. Doctors later transferred him to Valley Baptist Medical Center in Harlingen, where surgeons removed the bullet. “I’m really thankful for all of their efforts,” Martinez said. The bullet punctured his skull, Martinez said, but he never lost consciousness. He does not have any brain damage, KGBT reported. The Hidalgo County Sheriff’s Office said it is investigating the shooting. “We have reason to believe that he was hit by a bullet that was fired into the air,” according to a statement released by Sgt. J.P. Rodriguez, a spokesman for the Sheriff’s Office. Investigators recovered the bullet, Martinez said. “We’re blessed God was with us that evening,” he said.